Float fishing offers our clients access to miles of secluded water teeming with fish. If you have only done walk wade trips, float fishing gives opportunity and access to parts of the river you would never be able to fish walk wading. Our guides specialize in helping anglers of all experience levels explore what a river has to offer via a boat. Below are three very different river float fishing locations to expand your understanding of southwest Colorado float fishing. The Lower Gunnison River’s Full Day and Overnight Drift Boat Trips offer miles of secluded access to Gold Medal Waters that are floatable and fish-able most of the year. Though Summer and Fall is the time of the dry fly, early Spring offers great nymphing that can carry on through all the seasons. Fishing this section from a drift boat gives our clients access to areas you cannot reach when wading. Experience a fast-paced Day Trip float fishing on the technical waters of the Lower Uncompahgre. This rare opportunity to explore the private waters below Pa-Co-Chu-Puk offers anglers a chance to cast to rarely fished large trout that inhabit the Uncompahgre, all while enjoying the incredible scenery that surrounds the river. This section of river has a short but not to be missed season from late July to early September (water level dependent). Experienced anglers only. The serene beauty of Colorado’s Gunnison Gorge National Conservation Area (BLM) wilderness while float fishing from an inflatable raft with elevated swivel seating, is the ultimate angling experience. Trout well over 18 inches are not uncommon on “The Gunny”. With incredible aquatic insect hatches and idyllic riparian habitat, it’s no wonder the Gunnison Gorge float fishing trip makes the list of the world’s “50 Places to Fly Fish Before You Die!” by Chris Santella. Explore our Gunnison Gorge page to find out more about the trip and watch our Gunnison Gorge Three Day Deluxe Trip Video. Let RIGS help accommodate your travel needs with optional float fishing and drift boat meeting locations in Montrose and Delta. Need to meet or depart closer to Delta, let us meet you at our drift boat put-in at the confluence of the North Fork and Gunnison River (next to Gunnison River Pleasure Park) or Falcon Rd turn off for our float fishing trips – we’re happy to accommodate your requests. All Guided float fish trips are located within one hour of Ridgway Colorado. Directions to Fly Shop. *Any additional items needed can be purchased prior to your trip at our Full-Service Fly Shop. or on our Online Store. All rivers located within a one hour of Telluride, Ouray and Montrose Colorado. Directions to Fly Shop. *All major airlines service Montrose Regional Airport, located 30 minutes from our Fly Shop. Shuttle Services are also offered for personal vehicle transport on Lower Gunnison River and Gunnison Gorge trips. To help you plan your trip, we offer some great links to our Preferred Lodging Partners and Regional Information for Ouray, Telluride & Montrose Colorado. *Hunting & Fishing Licenses are available at RIGS Fly Shop. However, we encourage you to Purchase Fishing & Hunting Licenses Online prior to your trip. What is river float fishing? The guide/rower can position the fisher to have longer fly drifts and the ability to move upstream to remain in the most productive sections. 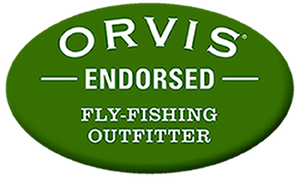 RIGS also has rental gear available for your Guided Fly Fishing trip!